The establishment of a new regional initiative to increase cooperation and coordination on transboundary water resources in the Middle East was announced on Aug. 31 in Stockholm, Sweden, and the Istanbul-based Turkish Water Institute (SUEN) has been chosen to be the host of the project's coordination office until the end of 2020. The structure of the new project will include water experts and decision makers from Turkey, Iraq, Syria, Jordan, Lebanon and Iran to increase the use of water as a tool for cooperation and minimizing the conflict over transboundary water resources in the Middle East region. "Turkey met the initiative in 2010, however, the official inclusion of Turkey took place in 2011. As a member of the [Blue Peace] initiative, Turkey has aimed to contribute in a way that would change perceptions on water 'as a source of conflict' to water 'as a reason for peace,'" Hasan Sarıkaya, a former undersecretary at Turkey's Environment and Forestry Ministry told Daily Sabah in the Swedish capital following the two-day meeting on the new initiative. The new project, supported by the Swedish International Development Agency (SIDA) and the Swiss Agency for Development and Cooperation (SDC), comes as a product of nearly a decade-old effort by Blue Peace in the Middle East, an initiative steered by the India-based think tank, Strategic Foresight Group (SFG). Sarıkaya said the new initiative, which will ensure that the decisions on the future of water will be decided by countries in the region, will also receive support from international donors on water projects, such as Sweden and Switzerland, and that the new establishment would include a Coordination Office, Thematic Activity Centers, Managing Committee and also a Policy Advisory Committee. "The new coordination office would be in Turkey for the next two years and this is, of course, is very important for Turkey that it would be active and influential in the communication between member countries and the Managing Committee on decisions made on the regional waters," he added. Sarıkaya, who is also a professor of environmental engineering with teaching and research experience of more than 40 years, highlighted that the there is a perception that it is difficult to cooperate in this region and that the aim of the new entity would be to prove otherwise, through water cooperation. "It is true that the words 'water' and 'conflict/war' have been used very closely; however, water has also been used as tool of 'soft power' between countries. Cooperation on water between countries can begin initially to meet human needs, but then, it can also act as a foundation for expansion of cooperation to primary policy matters in bilateral relations," Sarıkaya added. SUEN, acting as the host of the coordination office would help Turkish water experts to "have a more comprehensive understanding on the water problems in the neighboring countries," as well, Sarıkaya underlined. "The new initiative will also act as a platform for Turkey to better explain itself on water related projects that have received criticism," he said and added that while, "Turkey has always been in coordination with bordering countries on water-related issues. The new initiative will also expand cooperation with countries like Jordan and Lebanon, as well." 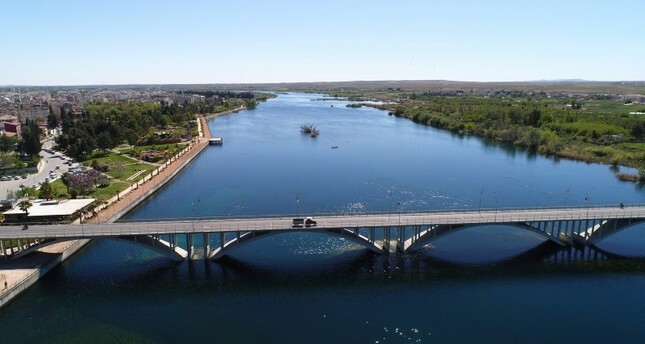 The debates on water between Turkey, Iraq and Syria on Turkey's water allocation from the two downstream, transboundary rivers, Euphrates and Tigris, are not new, particularly over Turkey's dam projects built on the two rivers, aimed to increase their effectiveness and efficient use. Iraq, for example, claims that Turkey has many sources of water, including rain and snow; however, Iraq's climate is dry and as a result, it needs more water flowing into it from the region. Baghdad also claims that agriculture is the main source of livelihood for a significant part of the population. Turkey, on the other hand, argues that the country is not a water-rich country and that in water-rich countries, the amount of water per capita is approximately 5,000 cubic meters, while in Turkey it is around 1,500 cubic meters. Furthermore, Turkey says that this number is expected to decrease to around 1,125 cubic meters in 2030 due to climate change and an increasing population. Turkey also argues that 60 percent of the Tigris (flowing from Turkey into Iraq) is located on Iraqi soil and that streams draining out of the Tigris in Iraq consist of 31 billion cubic meters of the total 52 billion cubic meters of water reserve for the river. The new establishment is expected to find solutions to disagreements through expert knowledge and an advisory group that would aim to influence decision makers. The new project has decided to initially work on "water use efficiency in agriculture" as a key area of focus. "Agriculture is important because regional countries such as Iraq, Syria and Turkey use the largest amount of water on agriculture and if the modern methods and technological tools are used in irrigation then water conservation for other areas could increase," Sarıkaya added. Earlier this summer, Turkey announced that it would postpone the filling up of its reservoir for the Ilısu Dam project built on the Tigris River on the borders of the southeastern provinces of Mardin and Şırnak with an estimated investment cost of TL 12 billion ($2.27 billion). The decision came amid a drought in neighboring Iraq, which has affected farmers, leading to violent protests against the government in the country. The protesters have blamed Baghdad of poor management of water resources, including the lack of modernization of infrastructure and methods. Turkey's step of goodwill will reportedly continue until the winter months. The new initiative is expected to overcome some of the domestic and regional issues related to water as it will also be acting as a platform for knowledge and experience sharing in the technical aspects on water governance. The two-day meeting was attended by former President of the Republic of Slovenia Danilo Türk, Swiss Ambassador to Sweden Christian Schoenenberger, SFG President Sundeep Waslekar, Deputy Head of Global Programme Water at SDC Eileen Hofstetter, President of Turkish Water Institute Ahmet Mete Saatçı and regional and international officials and experts on water, journalists and academics. "Water is a major challenge from which we can create future opportunities and strategies and develop creative visions to avoid existing potential conflicts over water. We also guarantee the rights of all individuals to this vital resource, and contribute to the reduction of resource infractions," said Danilo Turk, the chairman of the Global High-Level Panel on Water and Peace. Turk also said water diplomacy was important for water peace and post-conflict stabilization and that it was "important to revisit how to approach water cooperation and management" in the Middle East. Turk also told Daily Sabah that it was "a fundamental task to expand knowledge and raise awareness among the public" on water issues as a way to influence politicians on water related issues. Schoenenberger underlined the importance of sharing experiences and know-how to meet the challenges concerning water. He added that the issue of water goes beyond local, regional and global issues when countries share water resources and water basins to serve the interests of all parties. In the meeting, Waslekar highlighted the achievements of the Blue Peace Initiative since its launch in 2009, and its course in the Middle East in an attempt to propose practical solutions and enhance cooperation to reduce disputes over the issue of water. The SFG will transfer the operational steering to SUEN, which will be based in the coordination office in Turkey, starting Jan. 1, 2019.